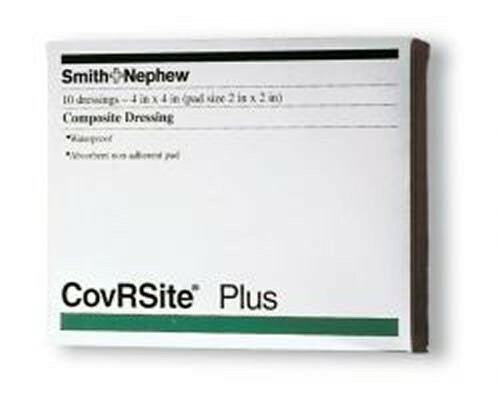 COVRSITE Plus BUY Composite Dressings, Smith & Nephew Dressings, Composite Dressings, C59715000, 59715100, Smith & Nephew COVRSITE Plus. COVRSITE Plus is a Composite Dressing manufactured by Smith & Nephew for the management of acute or chronic wounds. This Wound Care product, is a waterproof version of COVRSITE Cover Dressing. The COVRSITE Plus Composite Dressing is used as a primary or secondary dressing in the management of acute or chronic wounds. Dressing provides a barrier to bacteria. Can be used as an alternative to tape and gauze over central line dressings. COVRSITE Plus replaces traditional tape and gauze with a single step dressing. Helps protect the wound from contamination by urine and feces. COVRSITE Plus Composite Dressing Product Numbers: 59715000, 59715100. Size Options: 4 x 4 Inch and 6 x 6 Inch. Smith & Nephew COVRSITE Plus Composite Dressing Specific Coverage Criteria: Composite dressings are products combining physically distinct components into a single dressing that provides multiple functions to include a bacterial barrier, an absorptive layer other than an alginate, foam, hydrocolloid, or hydrogel, and either a semi-adherent or non-adherent property over the wound site. May be denied if used with a hydrogel because DMERC considers it an absorptive dressing (see coverage rules). Choose a dressing with a pad size slightly larger than the area of the wound. Remove the first tab from the underside of the dressing. Adhere the exposed adhesive side on one side of the wound. Remove the second tab and adhere the rest of the dressing over the wound.